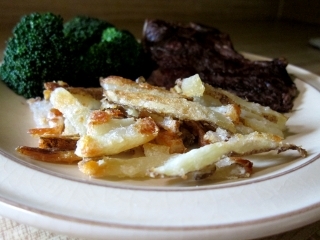 My sister-in-law introduced the family to these super delicious and crispy french fries! Make a double batch- yum! Place in a large pot of cold water. After an hour, bring the pot to a boil for 5 min. Drain water from pot and toss potatoes with corn starch to coat. Heat oven to 475 and place empty baking sheet on top rack to get hot. 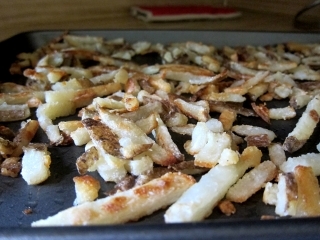 When heated, take out sheet and quickly add about 1/4 cup canola oil, spread potatoes on top, and put back in oven. One Response to "Oven French Fries"